2012 – MY INCREDIBLE YEAR!!!! Just some back ground. I started running late in 2006 when I was just 59 to raise money for heart research at the John Radcliffe hospital in Oxford where my husband, Harry, had been treated in the cardiac ward, successfully, a short while before. My first Marathon was the 2007 London Marathon in which I completed in 3:57, as a fund raising effort, with lots of chatting on the way, and I was more than pleased with the time. I enjoyed this race so much that I have continued running regularly since then. 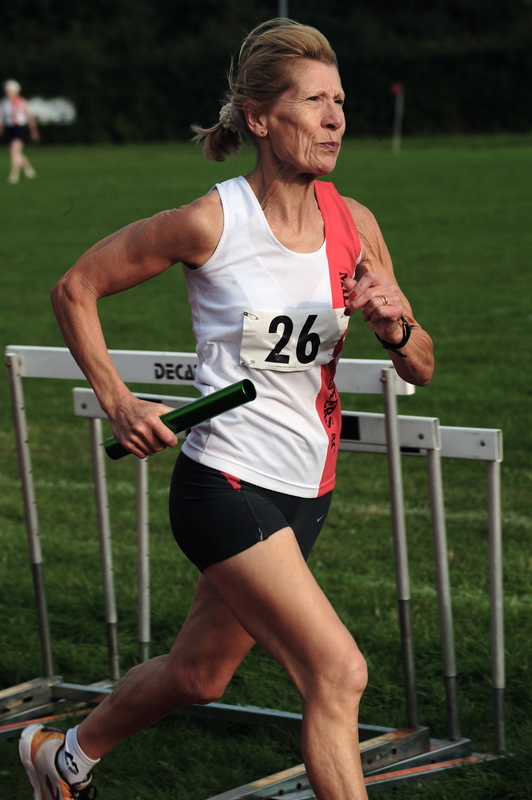 I joined my local club, Rugby & Northampton AC in August 2007 & with guidance from my good running friends have been lucky enough to make significant progress as a W60 including setting a number of British, European & World Masters age group records & best performances on the track & road. Even though I had some 5 years running experience, as I approached 2012 I felt slightly anxious about going into my new W65 age category. I should not have had any doubts because 2012 turned out to be another exciting year in road races, on the track & cross country. I am very lucky to have Ian Wilson as my coach, he sets me realistic training sessions which I can cope with & as a great understanding of just the amount of training I need to do. I train mostly with my friends from Brixworth, they are all younger than me but we all get on very well, have lots of fun & motivate each other. My track training is done at my club Rugby & Northampton. My first race in my new age category was the Virgin London Marathon, April 22nd just 2 days after my 65th Birthday. What luck! Ian asked me what time I was thinking of going for, I ran 3:20 in the autumn at Chester so I decided to try for 3:20 again. At mile eleven I went through a bad patch, recovered but had another at seventeen, losing two minutes from my schedule. My finishing time was 3:22.29 enough for a W65 BR & WBP. It was then just five weeks to the start of my club Masters T&F League season, so after a few days rest I went from long distance running to the track. I was surprised how quickly it all fell into place. With some good track races done I felt very confident going into my first European Masters Track & field Championship. The weather was on the warm side which I favour, I enjoyed every race 400m 800m 1500m & 5000m four gold medals it was unbelievable. To make it more exciting I was given a place in the British Masters W60 4x400m relay team. We all had a good run with near perfect change overs, we were 1st & it was an ER. I have great memories from the Europeans in Zittau which will stay with me always. On the 5th September, Coach Wilson suggested I do the one hour track race, as a guest, at Leamington Cycling & Athletic Club Championship. I had never done an event like this & was pleased to set another British W65 Best Performance with 14,009m. I don’t know if anyone can enjoy running round a track for one hour, but it gave me plenty of time to think about what other races were next on my list. This included the British Masters ten mile road race in October & another W65 Best performance. September saw the Rugby & Northampton Club Masters finals, & as I scored top points the club awarded me R&N Athlete of the year. I was so proud to receive this trophy. To complete my 2012 year, in November I was offered a place in the British W65 Cross Country team for the international cross country race in Belfast. I loved this race, the atmosphere was amazing. I won the W65 race & lead the British W65 team home to 1st team place. I thought this was the perfect end to my 2012 season that was until I heard that I am to be awarded European Masters Woman Athlete of 2012. I feel honoured to receive this award & I would like to thank everyone who voted for me. Since I have been a runner it has turned my life around & I have met some great people as well as great athletes. Thank you Masters Athletics. Best wishes to you all for 2013!